Disposable elastic gloves are widely used in scientific laboratories and in many industries for the handling of critical surfaces. Typically, they are made from nitrile or latex rubber and provide the user with protection from organic solvents, medical and biological fluids, various aqueous acids and bases and other potentially harmful substances. Disposable gloves can also protect analytical samples and manufactured products from becoming contaminated with skin cells, salts, hand lotions, cosmetics, oils or other residues that may get transferred on contact with bare hands. However, disposable gloves themselves can also be a source of contamination on handled surfaces, a factor that can be overlooked. Most of the gloves used in labs have a primary polymer structure and also contain different types of inorganic salt additives. Silicone-containing mold-release agents that allow for easy removal of powder-free gloves from the glove formers may also be present on glove surfaces. The outer glove surface is often oxidized using post-forming processes such as chlorination to minimize surface tackiness. In addition, polymeric surface coatings may be applied to the inner surface of disposable gloves to improve donning properties. These inner coatings and other bulk glove components may permeate the glove material and segregate to the outer surface of the glove on exposure to certain solvents. When items are rinsed, contact with solvents may also lead to glove components being transferred to their surfaces. Such contamination can have an adverse effect on materials used in industries where optimum product performance depends on surface cleanliness. It can also affect sample analysis depending on the sensitivity and specificity of the technique. It is therefore essential to know whether any of the components in a particular glove material are leached out by certain solvents or if any manufacturing residues present on gloves’ surfaces get transferred easily to other materials. Using X-ray photoelectron spectroscopy (XPS), a disposable glove’s chemical and elemental surface composition can be evaluated. This qualitative and quantitative surface-sensitive method can also determine whether any contamination is transferred from gloves to other surfaces. 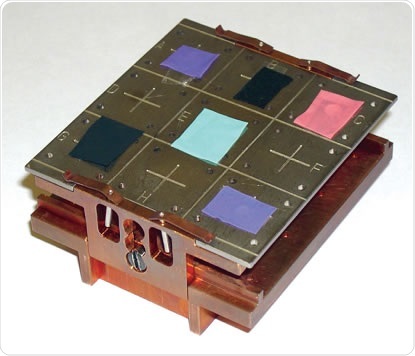 A Thermo Scientific K-Alpha XPS instrument (Figure 1) was used in this study to characterize the inner and outer surface compositions across a range of commonly used laboratory gloves. The glove surface composition changes that occurred due to exposure to several common laboratory solvents were also examined. The study also evaluated the transfer of surface components from the gloves and clean aluminum foil surfaces by light touching. In this analysis, seven nitrile, seven latex, and one neoprene powder-free laboratory gloves were studied. In order to avoid any potential external sources of contamination on the glove surfaces, new glove samples were taken from sealed boxes of each type. A pair of scissors was used to cut sections (ca. 1mm × 1mm) from the finger region of each glove. The inner and outer surfaces of each glove were examined, which was followed by re-analysis of each glove’s outer surface after a 5-minute rinse (and air dry) in four different commonly used laboratory solvents, namely acetone, hexane, chloroform, and methyl alcohol. The surface of clean household aluminum foil (Reynolds Wrap®) was lightly touched with a gloved finger and the foil’s smoother (bright) side then analyzed to test whether any glove components on the gloves’ outer surfaces were transferred to other surfaces. With its ability to hold a large number of samples, the K-Alpha (60mm × 60mm) sample stage provides high sample throughput and can also be height adjusted to accommodate samples that are up to 20mm thick. Figure 2 shows a K-Alpha sample stage that is loaded with numerous sections from different glove samples mounted on double-sided tape. The analysis conditions on the various insulating glove samples were kept stable using the K-Alpha’s simple turn-key charge compensation system. The K-Alpha XPS system features a monochromated microfocusing Al Kα X-ray source with a variable spot size (i.e. 30–400μm) and a 128 multi-channel detector. A 400μm X-ray spot size was used to conduct all of the aluminum foil and glove sample analyses. 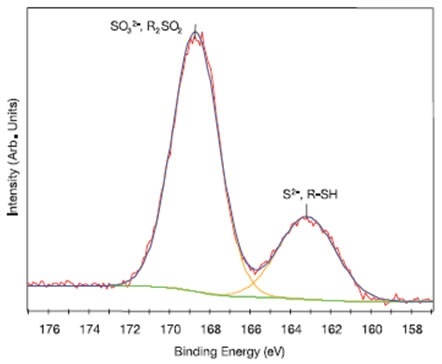 The survey spectra of 0–1350eV were collected for qualitative and quantitative analysis and high-resolution spectra were acquired for chemical state characterization. Binding energies were referenced to the main hydrocarbon C 1s peak = 285.0eV. An Ar+ ion gun, operated at 1000eV and rastered over a 2mm × 4mm area, was used for depth profiling studies. Sputtered depths were calibrated with a 100nm SiO2/Si standard. Fast and easy qualitative and quantitative elemental characterization of glove surfaces can be achieved using the XPS survey spectra. Examples of these spectra are shown in Figure 3 for the outer surfaces of a latex (Latex #2), nitrile (Nitrile #4) glove. These results show there can be large variation between the surfaces of different laboratory gloves. The nitrile glove used in this experiment had only a small amount of oxygen along with a few minor surface components (e.g., Si, S, and Ca). The latex glove, on the other hand, had around ten times the oxygen present, much less carbon present, significant amounts of N, Mg, Si, S, Cl, and Ca and minor amounts of P and Zn. Table 1 summarizes a select subset of all the data collected in this analysis. The data showed that the qualitative and quantitative surface compositions varied substantially among the different brands and different types of latex, nitrile and neoprene gloves. In addition, the surface compositions varied substantially between the inner and outer surfaces for all the gloves tested. The following elements were detected on the surfaces of one or more of the gloves: C, N, O, Na, Mg, Al, Si, P, S, Cl, K, Ca, and Zn. The chemical states of carbon on the surface of gloves can be determined by high resolution XPS (Figure 4 shows this for a nitrile glove). 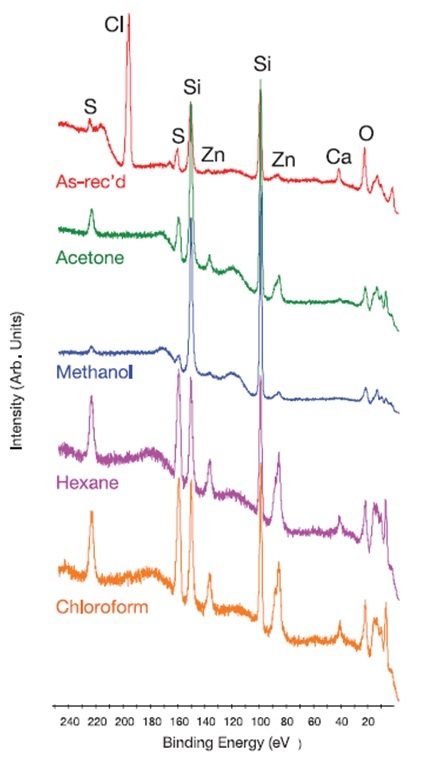 Aside from the main hydrocarbon peak (285.0eV), a peak corresponding to nitrile (C-N) and/or ether/alcohol (C-O) functional groups as well as a peak characteristic of carbonate species were observed at 286.6eV and 290.2eV, respectively. 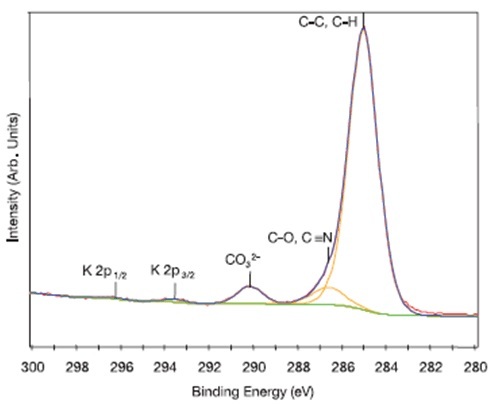 The presence of K 2p peaks in the C 1s region confirmed that trace amounts of potassium were also detected on this particular sample. In several other gloves, a peak corresponding to carbonate species was also seen in the C 1s spectra. Information about the functional groups present on glove surfaces can be useful for determining compatibility with other materials and when tracing contamination sources on handled materials. 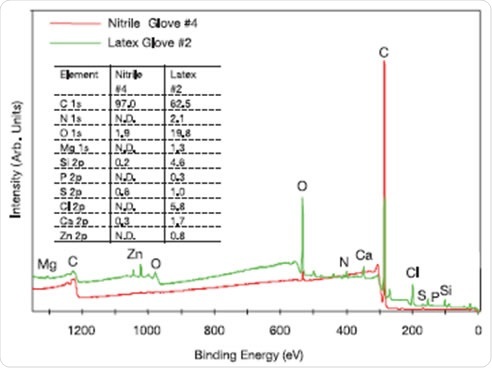 The chemical states of other elements present on glove surfaces can also be analyzed using high resolution XPS, as shown in Figure 5 for a nitrile glove (Nitrile #2). On this glove, sulfur was detected in two chemical states characteristic of sulfate (SO32-) and/or sulfone (R2SO2) species (168.7eV) plus sulfide (S2-) and/or mercaptan (R-SH) species (163.2eV). The high-resolution XPS results acquired for the various types of gloves suggested that, in general, when N was detected, it was present as organically bound nitrogen species (~399–401eV) and/or nitrates (~407eV), P was present as phosphates (~132–133eV), Cl as organically bound chlorine (C-Cl) and/or chloride species (~199–200eV), and Si as silicone and/or silicate species (~102–103eV) and any metals detected were found to be present in their highest oxidation state. Figure 4. High resolution C 1s spectrum fitted with three peaks for the outer surface of Nitrile Glove #7. Note that trace amounts of potassium were also detected on this sample. The use of laboratory gloves is the most common way of protecting people from contact with hazardous chemicals. The use of certain chemicals can lead to glove components being removed from the glove surface or cause the segregation of bulk components to the glove surface. Hence, it is important to understand how the surface composition of laboratory gloves are affected by various chemicals and XPS is ideally suited for this purpose. 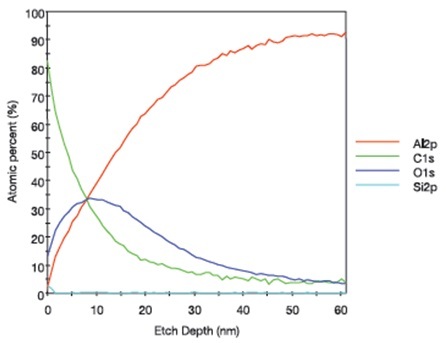 Wide range (0–250eV) high resolution XPS spectra acquired for an as-received latex glove (Latex Glove #3) and the same glove type following a 5 minute rinse in the four different solvents are presented in Figure 6. The spectra show that the solvent rinses affect the glove’s surface composition. 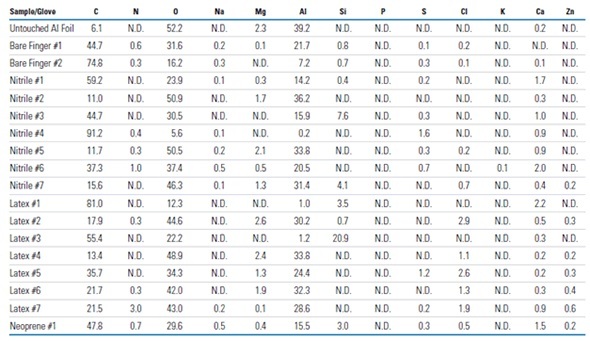 Examples of the qualitative and quantitative XPS results acquired for solvent rinse studies on a nitrile (Nitrile #7) and latex glove (Latex #3) are summarized in Table 2 and show that the rinsed gloves’ surface composition varied widely with the type of glove and the solvent. For instance, Cl was removed by all four solvents from the surface of Latex Glove #3 below the detection limit, whereas Cl was only removed from the surface of Nitrile Glove #7 by methyl alcohol. Compared to the as-received glove, rinsing Nitrile Glove #7 with either hexane or chloroform increased the Cl concentration by several times, whereas the effect was only minimal when acetone was used for rinsing. Si was partially removed from the surface of Nitrile Glove #7 by all four solvents. However, the concentration of Si on the surface of the Latex Glove #3 was substantially increased by all four solvents. Similar variable composition results were obtained for other gloves investigated in this analysis. From this study, it is clear that commonly used solvents can alter the surface composition and the contaminants present on laboratory glove surfaces. 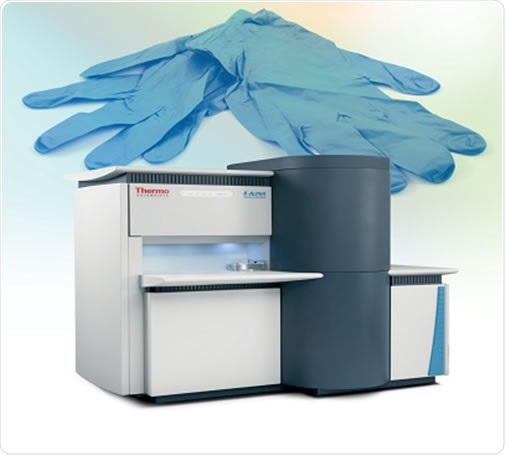 In most industries and laboratories, surface contamination on analytical samples or other handled materials caused by the transfer of residues present on gloves is probably overlooked. However, such contamination can be important and should be taken into consideration. 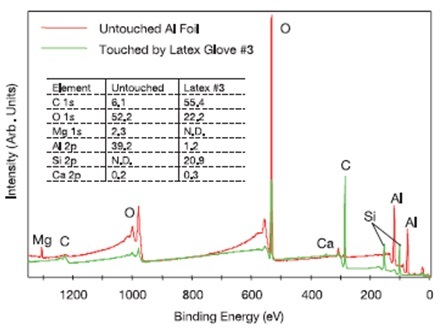 For example, the XPS survey spectra acquired for a clean, untouched sample of aluminum foil and for the same foil after being lightly touched with a gloved finger (Latex #3) are shown in Figure 7. The main components present on the foil were C, O, Mg, and Al, as well as a trace level of Ca. After the touch test, there was a substantial increase in the surface concentration of C compared to the clean surface (55.4 at.% when versus 6.1 at.%) and Si, which was not detected on the clean foil, was now a key surface component (20.9 at.%). Following the touch test, the main surface components found on the foil were C, O, and Si, a small quantity of Al and a trace level of Ca. For the silicone species, the observed binding energy of the Si 2p peak (102.5 eV) was found to be consistent on the glove touched sample, suggesting silicone oil surface contamination on this type of glove. The qualitative and quantitative XPS results acquired for the aluminum foil touch tests for all the glove samples are summarized in Table 3. The results indicated that once a foil sample was touched with a bare finger (Bare Finger #1), there was a transfer of C, N, Na, Si, S, and Cl to the foil surface Similar results (plus a trace amount of Ca) were obtained with a second touch test with a bare finger after first lightly wiping the finger on the individual’s forehead. However, the surface concentration of C was much higher in the second bare finger test compared to the first bare finger test, without the preceding forehead wipe. This indicates a surface contamination caused by skin oils being transferred between the forehead to the bare finger in the second bare finger test. The results presented in Table 3 reveal the potential transfer of C, N, Na, Si, S, Cl, K, Ca, and Zn to other touched surfaces depending on the type of glove used. There was considerable variation in the amount of these transferred elements detected on the foil surfaces among the different types of gloves. C was the most frequently and presumably easily transferred element irrespective of the glove type. The surface concentration of C on the foil was (91.2 at.% C) in the case of Nitrile #4, making the underlying aluminum foil barely detectable (0.2 at.% Al). Nitrile #2 was the only one of the 15 gloves that showed no detectable transfer of surface contamination to the aluminum foil aside from a slight increase in the level of surface carbon species. 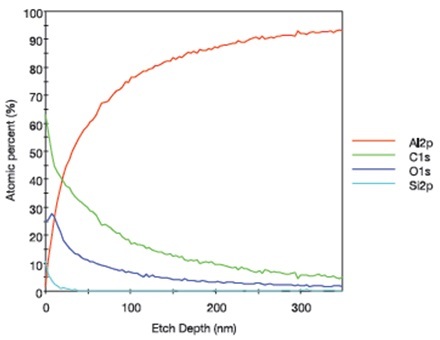 The XPS depth profile for an aluminum foil sample that was lightly touched with Latex Glove #1 is shown in Figure 8 and indicates that the silicon-containing species was concentrated in the topmost ~2-3nm of the surface of the sample and a carbon/oxygen-containing material was detected to a sputtered depth of ~40nm. The XPS depth profile for an aluminum foil sample after it was lightly touched by Latex Glove #3 is presented in Figure 9, which shows that Si was concentrated in the topmost ~10nm of the surface of the foil and a carbon/oxygen-containing material was detected to a sputtered depth of > 100nm. As shown in Figures 8 and 9, the aluminum foils touched by Latex Glove #1 and Latex Glove #3 have different relative C and O profile shapes, indicating that the transferred carbon/oxygen containing materials had different compositions. In addition, the results suggest that the surface contamination layer thickness resulting from laboratory glove contact varies considerably with glove type. This analysis investigated the surface compositions of different types of laboratory gloves using the K-Alpha XPS instrument. The XPS results showed that in addition to the expected presence of rubber polymer compounds, there may also be silicones and many other compounds that contain O, Na, Mg, Al, P, S, Cl, K, Ca, and/or Zn present on the outer surfaces of gloves. A number of these additional components may easily be removed from the surface of the glove or may diffuse from the bulk glove material to the surface of the glove when contact is made with common laboratory solvents. Furthermore, many of the components on the glove surface could transfer to other surfaces simply through light touching. During the touch test of 15 gloves, only one glove did not transfer substantial quantities of contaminants to the aluminum foil. Therefore, it is advisable to always use clean handling tools instead of gloved hands for sample handling in surface sensitive analyses such as XPS and for handling materials where surface cleanliness is imperative. However, if the laboratory or manufacturing process uses gloves, then XPS is an ideal technique for examining the gloves’ surface composition and for assessing the likelihood of contamination being transferred to handled surfaces. Thermo Fisher Scientific would like to thank John Piasecki, formerly with RJ Lee Group, Inc., USA, for his assistance in performing this study.